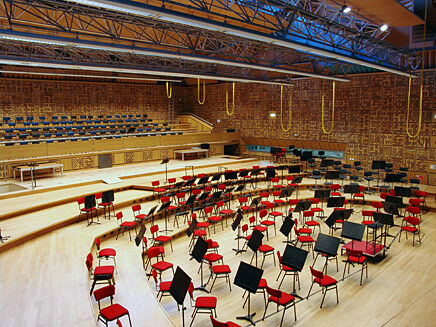 This is the largest hall of the Netherlands Broadcasting Music Center and home of the Netherlands Radio Philharmonic Orchestra. The studio has a large multi-leveled stage. There's also a spacious balcony to accommodate the Netherlands Radio Choir, and even - if applicable - another choir. MCO5 has a control room for recordings. Acoustical panes for diffusions and adsorption have been fitted as well as remote controlled curtains which can alter the resonance of the sounds made in the studio.